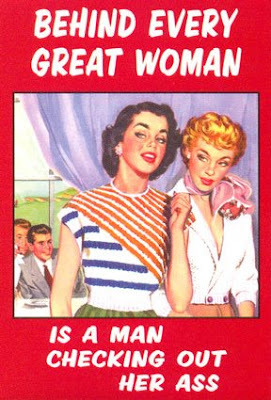 Whoa. . .two posts in two days - Believe it!! I just have to brag, I got my craft-on again yesterday. I worked mostly on on the Halloween piece but also worked some on a few other projects. I think I've switched gears again and my new crafty obsession is collage (again). Right now, I'm carrying around a craft bag full of colored pencils, pastels, watercolors, watercolor pencils, acrylic paint, various papers (from old books, newspapers, copy paper, cardstock, tissue paper, etc. ), magazines, scissors, sharpies, and glue sticks. Of course, there are probably also some shrink plastic squares somewhere in the bag's depths in case I change gears. Hopefully, I will complete the Halloween piece tomorrow so it will be ready for the big day. 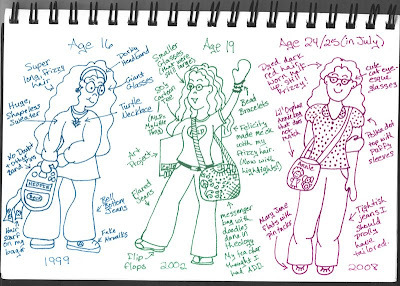 Check out this blog that challenges bloggers to draw themselves as teenagers. There are over 500 links to bloggers who took the challenge. It is kinda old (started in April), but people are STILL posting pics there. Since I can't draw I will NOT be contributing, but I've have had fun looking at the others. Here's one example of one of the early ones. I find this photoblog of elders with style, called Advanced Style, really interesting. I only hope that I'll have developed my own style by the time I'm the age of some of these individuals. That's one of those things I still struggle with. Holy Cow, if I didn't already have plenty of reasons for wanting to get pregnant. Now there's an iPhone pregnancy application, Expecting, to walk women through the 9 months. Geez, a geek pregnancy would rock! How creepy is this body in a bag costume? As if I haven't already shared enough pumpkin carvings, here are some geeky pumpkins. If you have any reason to want to make fake snot and didn't know how. This tutorial will help ya out! I guess that will do if for today. Maybe you'll see me tomorrow. We'll see.